For anyone looking to spruce up their home's decor, the CTS Air Plants 10-Pack Easy Care Assortment is an excellent option. These CTS Air Plants are low-maintenance plants that require minimal care. To care for these plants, simply saturate them with water once or twice a week and allow them to dry before returning them to their containers. To help your plants thrive even more, supplement with fertilizer or plant food a few times per year. The CTS Air Plants 10-Pack makes a great gift for plant lovers, even if they don't have the greenest thumb. Because these plants require so little care, it's almost impossible to kill them. There's no need to worry about your little houseplants from CTS, whether you give them as a gift or want to keep them for yourself. This assortment of air plants is sure to be among your favorite decorative accent pieces. The small to medium size(1"-6") and low-maintenance nature of these plants make it so you can easily place them anywhere, either in your home or outside on a deck or patio. You can use these as table decorations, in a wall display garden, or in any other position or placement. With their adorable small sizes and unique fern-like appearance, these CTS Air Plants are a prime option for any household. These plants are small, perfectly sized for miniature glass terrariums, glass pots, wall planters or even bottles. Because air plants absorb nutrients through the leaves there is no need to pot in soil. These plants are ideal for indoor gardens or displays and are a beautiful addition to any home. This adorable air plant set is comprised of ten easy to care for Tillandsia air plants. These beautiful air plants add a fun flair to your home's aesthetic with a modern, minimalistic, yet natural feel. With this gorgeous CTS Air Plants Tillandsia Ionantha 10-Pack, you can give an easy, instant boost to the decor and appeal of any home without cramping your style. NO SOIL REQUIRED - These plants are small to medium and perfectly sized(1"-6") for miniature glass terrariums, glass pots, wall planters or even bottles. Because air plants absorb nutrients through the leaves there is no need to pot in soil. These adorable plants are ideal for indoor vertical gardens or displays. These convenient plants are a beautiful addition to any home. LOW-MAINTENANCE - These CTS Air Plants are low-maintenance plants that require minimal care. To care for these plants, simply saturate them with water once or twice a week and allow them to dry before returning them to their containers. Supplement with fertilizer a few times per year. This assortment of tillandsia air plants is sure to be among your favorite decorative accent pieces. Comes with color care instructions to ensure strong and lasting hues. TABLE SWAG & WALL DECORATION - The small/medium size(1"-6") and low-maintenance nature of these plants allow you to easily place them anywhere in your home. You can use them as table decorations, in a wall display garden, or in any other position that tickles your fancy. With their adorable sizes and unique fern-like appearance, these CTS Air Plants are a prime option for any household. 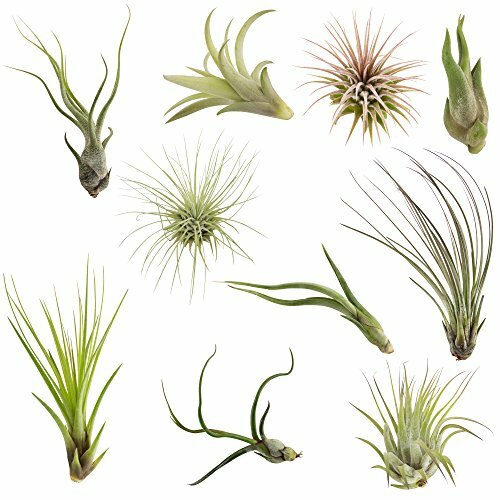 GREAT GIFTING OPTIONS - The CTS Air Plants Tillandsia 10-Pack makes a great gift for plant lovers, even if they don't have a green thumb. Because these plants require so little care, it's almost impossible to kill them. There's no need to worry about your little houseplants from CTS, whether you give them as a gift or want to keep them for yourself. BEAUTIFUL PLANT SET: This adorable air plant set is comprised of ten easy to care for Tillandsia air plants. These ten beautiful air plants. Including-capitata peach, butzii, pseudobaileyi, tricolor v melanocrater, fuchsii, ionantha, caput medusae, etc. Add a fun flair to your home's aesthetic with a modern, minimalistic, yet natural feel. With this gorgeous CTS Air Plants Tillandsia 10-Pack, you can give an easy, instant boost to the decor and appeal of any home without cramping your style. If you have any questions about this product by CTS Air Plants, contact us by completing and submitting the form below. If you are looking for a specif part number, please include it with your message.